It is a sign of the ongoing scarcity faced by the construction industry that architecture graduates are anecdotally having a lot of trouble finding work. The federal government’s stimulus package has long since dried up and the big end of town is once again executing layoffs left and right. 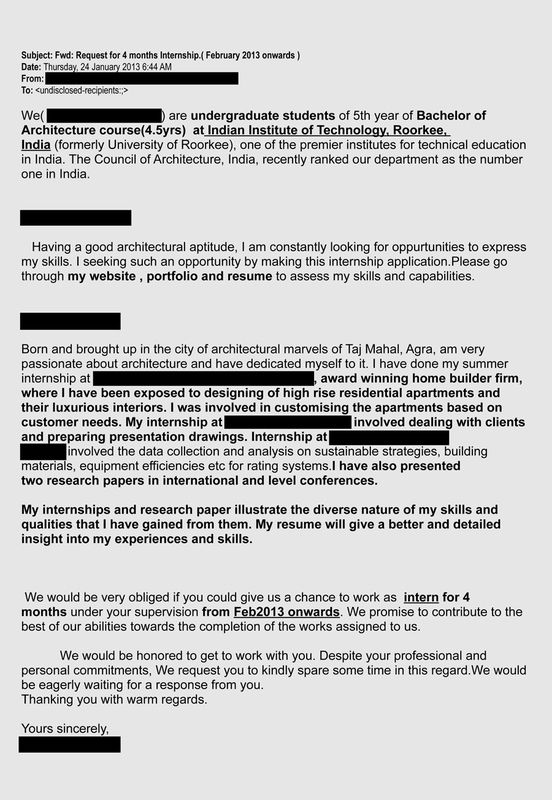 Though our architecture practice is small, on average we nevertheless receive one or two job applications a week. Many come from overseas and most are not very good. At the best of times, a poor application is a great way to be instantly forgotten. When the demand for jobs is as high as it is now, it takes even less for your application to find its way quickly to the bin. Architecture graduates, if you want to find work in this highly competitive environment, you need to not only be the cream of the crop, you need to convince potential employers you are. This begins with your job application. In the digital age, there is no excuse for not knowing the names of the principal architects of our practice. Spend a few minutes trawling our website or even cold call us if you must. The simple gesture of addressing your application to an actual person shows you have invested thought into your application. It displays basic business savvy and in a small but significant way shows that you care where you work. Further, an application addressed to Sir or Madam, an undisclosed recipient address and generic content are all dead giveaways that you have sent your application out en masse. Why should we bother treating you like an individual when you have not extended this same courtesy to us? It does not take much extra effort to send an email out separately and tailor it to our practice profile. At the very least, relate your application to the size of our practice and project typologies on which we work. If your aplication contains speling, grammer, and, errors syntax; we willnot give you the job.. Our logic is simple: if you do not have the ability or presence of mind to make sure you get this most basic of items right, how can you possibly be expected to tackle the more complex demands of the job you are seeking? Dictionaries, spellcheck and friends who speak the english language better than you do have all been around for a long time. Use them. Years ago, when we were looking for student architect positions, the principal architect of one particular firm flipped rapidly through our painstakingly presented portfolio and dismissed it with the spirit-crushing words, “I want to see skills not content”. Unless working as a CAD monkey for the rest of your life appeals, when a prospective employer says something similar to you, do as we should have done: thank the person for their time, leave the office and never return. The lasting lesson here is this: your portfolio should demonstrate both skills and content. Sure, we want to see that you know how to use AutoCAD, Rhino, Photoshop et. al. but we also want to see that you have an ability to design good buildings. A good portfolio can demonstrate both with ease: not only its content but its graphic design will speak volumes about your sense of style as well as your technical abilities. Do you enjoy long-distance running? Do you speak a second language? Do you spend your winters snowboarding? Have you travelled? Have you undertaken pilgrimages to notable buildings in obscure corners of the world? Do you have a collection of modernist chess sets? We do and we have, so why can’t you? Your application letter is not the place for an essay on your life’s experiences, but it is the place to communicate a few of the more fascinating things that interest you. Reading and watching movies are unhelpfully generic, though translating Italian poetry and sneaking your way into Hollywood film premieres are not. You’re busy, we’re busy, so keep it brief. Different countries have different expectations of job applicants. Some demand rigid formality, others prefer a more casual approach. Some want to know what grades you received in primary school, others are content to know that you passed your university degree. Whether you are an Australian looking for work overseas or a foreigner looking for work here, do some research into the country where you are applying before you send out your applications. You can start by reading this article and others like it. Get a feel for what the architecture industry may expect before you inadvertently put your international foot in it. Of all the applications we have received, only one arrived in the letterbox. In this day and age, it was refreshing to receive something physical to review. This is not to say that you should spend hundreds of dollars printing out full colour portfolios for the dozens of architecture practices to whom you are applying. Rather, pick a few more likely prospects, call first to see if they might be hiring and only then hit the print button. Your application may be on paper, but long gone is the day when you are restricted to its crisp, white confines to express yourself to potential employers. Social media has drastically altered the way in which you can connect with us: do you have an online portfolio? Do you use Twitter? Do you write a blog? Do you have a LinkedIn profile? There is no better way to convince us you are invested in architecture and interested in the same things we’re interested in than by being able to answer yes to all of the above. What’s more, long before you start applying for work, you should use social media as an opportunity to connect with your local architecture community. If you might one day be interested in working with us, you should follow our blog, follow us on Facebook and Twitter, and even connect with us on LinkedIn. Architecture is not like other professions. Many practices are small like ours and enjoy family-like working environments. Even the larger practices still pride themselves on their creative approach to the workplace. As such, it is important that you are interested in what we do, both within our practice and as part of a broader community. Are you a member of the Australian Institute of Architects? Have you volunteered at Melbourne Open House? Have you attended a Robin Boyd Foundation open day? Or a Melbourne Architours tour? We attend the events run by these organisations, so you should too. At the very least, you will learn something from the event; you may even get the opportunity to meet us in person. When we subsequently receive your application, we will know you as an individual, not just anonymous writing on the page. If you can communicate your passion for architecture not just by the things you say but by the things you do, you are one big step closer to relating to us as part of our world. 10. What do you want? Finally, put some thought into where you want to work. A large firm will give you exposure to significant buildings but will restrict your day-to-day tasks to only a few aspects of a project. A smaller firm won’t give you the variety in building typologies, but is much better placed to give you experience across the full range of an architect’s responsibilities. Do you want to work on institutional projects, or houses, or commercial developments? Are you keen to work with a practice renown for its design abilities or would you prefer one that has a reputation for strong client relationships and repeat business? We understand that it’s unlikely today that you have the luxury of choice. However, working out what you want will help you better target the right segment of the profession and will put you in a more self-aware position once you’re offered a job. We are sifting through a pile of 40 applications for an advertised position. We can’t possibly interview everyone so how can we quickly and efficiently reduce the pile to a more manageable size? First, we get rid of anyone who hasn’t nailed the basics: addressing us by our names, avoiding spelling mistakes etc. There are now 30 left in the pile. Second, we ditch anyone who doesn’t seem to know anything about who we are and what we do. Now we’re down to 20. Third, we look at basic layout and graphic design. This leaves us with 10. Only then do we start looking at content, trying to understand who you are. If we happen to recognise your name from an event we attended or via our blog’s subscriber list, even better. Every little bit will help you be one of the 3 or 4 people we’ll interview. It seems so simple and yet I also receive so many applications that don’t pass the initial screening process due to poor grammar or because they are not specific to what we do. Positions in the landscape industry are rare and applicants really need to spend time on these basic details to stand out. It’s interesting to note that when I put my mind to it, I can easily recall the applications that have stood out for us. Not only have they gotten the basics right, they’ve somehow managed to communicate the sort of person they are i.e. the sort we want working with us. I think at the end of the day, the whole application and hiring process is about finding the right employer : employee fit. What’s right for us may not be right for other practices, but hopefully when we’re offering, the right employee is looking. Number 3 stood out to me – sometimes I think I should be grateful for any job offer that comes along (and it’s true, at this point while still a student I will benefit from any work experience anywhere) but it’s a good reminder for me to value my own work and hope potential employers would too. Thanks for your comment, Apple. It’s true that students aren’t likely to earn as much for a studio as they will cost. But an architecture practice is about much more than bottom line earnings: if money is what we were after, we’d have been far better off going into banking or project management or pretty much any other occupation. It’s about social responsibility, contribution to the built environment, spending each day doing something we love. Aside from all that, it’s absolutely critical that students are given the opportunity to gain experience: where else will tomorrow’s architects come from? Thanks for commenting on my blog post! You are so right in the points you make and it is very interesting reading the other side of things. The scenario you just described was demonstrated to us in uni which is kind of a good reality check. Realising you have a screening process to pass through way before people will bother to read the contents of your CV is a really important step in designing a CV and approaching a practice for an opening. In a weird twisted way I think the whole process if quite fair; everyone gets what he or she deserves in the end – give or take. If you haven’t spend time to research where you want to work and why you are most likely to end up in a place where they don’t care about what you wish to gain from the experience and just get a generic overview of the practice not really doing what makes you happy. That’s right, the street goes both ways: we’re looking for people tuned into our way of engaging with architecture; graduates should be looking for practices in exactly the same way. When I first started working, I learnt this the hard way – I worked at a terrible practice for a year that didn’t fit me at all. Learnt a lot about what not to do! This is great. Thanks for sharing! I actually thought the first one was alright until I read the rest of the article.